They have released the free files for this Week: March 9th, 2015. They’re available until midnight on the 15th March. 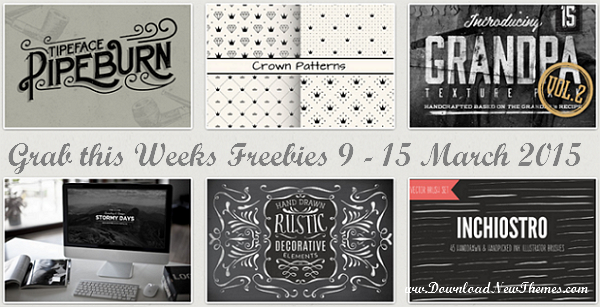 Grab this weeks freebies from across Creative Market. This font have some alternative styles, so you can make the style you need. Pipeburn Typeface suitable for vintage design, posters, brand name, labels and etc. This weeks freebies font on creative market. Stormyday is a unique, multipurpose WordPress Theme which enables you to create almost unlimited amount of different and unique page layouts.This weeks freebies WordPress Theme on creative market. This decorative element vector kit is a great addition to any designers toolbox! Create unique, beautiful logos, signage, posters, invitations and much more. Combine the individual hand drawn swirls and curls to form an almost-endless combinations of designs and decoration. Add some beautiful rustic fonts and you have an instant vintage look! This weeks freebies vector kit on creative market. This 45 brush set from real ink strokes (carefully scanned, traced and converted into illustrator art brushes). After installing you can apply it to your vector art and get some awesome results! This weeks freebies brush pack on creative market. Set of 4 seamless crown monochrome patterns on beige backdrop. Zip file contain: 4 EPS + 4 JPG. This weeks freebies graphics objects on creative market. In this pack it has 15 different styles of textures, handcrafted and authentic vintage design stuff. Item Reviewed: Grab this Weeks Awesome 6 Freebies 9 March 2015 9 out of 10 based on 10 ratings. 9 user reviews.